How lucky are we in Vermont, and especially in the Chittenden County zone, to have a collection of committed artisan bread bakers? The answer: Very. So many of them are so good, it's almost an embarrassment of riches when you peruse the bread shelves of the local grocery stores. For a guy like me who grew up on Wonder Bread - and cajoling my mother to remove the "crusts" at that - I've come a long, long way. My entirely subjective vote for the grandest local breadsmith (and let's hear yours via comments) is the venerable O'Bread Bakery of Shelburne. The lovely Chuck and Carla Conway are the owners, and they have dedicated their entire adult lives to producing bread, real bread, bread that nourishes the body and soul. 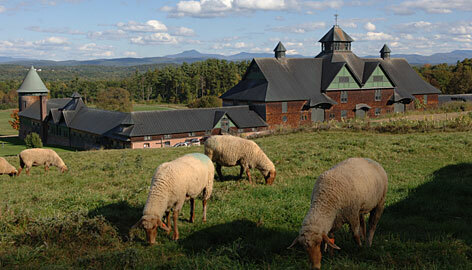 Since 1977, they have been one of the few, if only, private business allowed to operate on the grounds of Shelburne Farms. Visiting their ovens located in the towering castle barn is like a trip back to the 16th Century. O'Bread makes a variety of loaves, each one more delectable and enchanting than the next. Allow me this paean to my favorite, their take on raisin bread, which they named, "Cinnamon Raisin Swirl." It's so friggin' good that words fail me, and I'm a certified professional writer. Let's just use a word so favored by the younger generation: This bread is sick. A Chi Kung teacher of mine was attempting to explain "chi" to the class. The concept of chi underlies the entire range of Eastern movement practices including T'ai Chi and the various martial arts. (It's also the basis of traditional Chinese medicine, including acupuncture.) So he says, "Chi dwells at the intersection where energy becomes matter and matter becomes energy." Hmmm, thinks Grasshopper . . .
What does this have to do with O'Bread's Cinnamon Raisin Swirl? Hey, don't rush me. The thing about this heavenly loaf is that it's just too savory to call bread; it's more like cake. But, then again, it is definitely bread-like in shape and size. So, this is what I've come up with: O'Bread's Cinnamon Raisin Swirl dwells at the intersection where bread becomes cake and cake becomes bread.